Tim Razzall’s has been an extraordinary career as a lawyer, a businessman and politician. 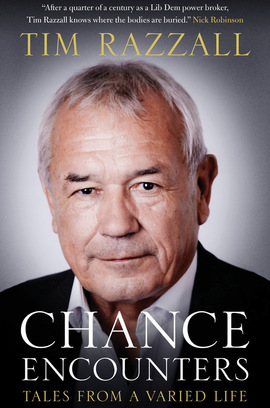 Chance Encounters is not so much a traditional autobiography, more an insight into the personalities who have crossed his path in life and the extraordinary events that he has been a part of – including encounters with such eclectic personages as Frank Sinatra, Robert Maxwell, The Beatles and Bill Clinton. His political career began as a local councillor in Richmond where the capture of the control of the Council from the Tories was an early forerunner to the revival of his party. As party treasurer for twelve years he is frank about the donors he succeeded with or failed to attract and the problems caused by a rogue donor Michael Brown. As a close adviser to both Paddy Ashdown and Charles Kennedy he was at the heart of the often covert relationship with Tony Blair aimed at joint electoral opposition to the Tories. As the election chair in 2001 and 2005 he played a key role in the increase in Liberal Democrat seats in those elections. He is similarly frank about the problems that led to Charles Kennedy’s resignation – not just the result of alcohol. As a member of the House of Lords since 1997 he gives an insight into the personalities and problems of the current house. An account of Razzall’s entertaining life outside politics… great fun to read about, full of name-dropping of the famous and tinged with sadness … It all makes for an enjoyable read, as the eclectic mix of names in the index – from Mohammad Azharuddin through to Sandi Toksvig and Bill Clinton – demonstrates. After a quarter of a century as a Lib Dem power broker, Tim Razzall knows where the bodies are buried. Tim Razzall’s experiences involve law, business, sport and politics at the top level. Few politicians have led such a fascinating life.